I have been making reservations this week for 3 Gun matches across America for the rest of the year, and it reminded me to put down a few words for people who might be interested in how to get involved in 3 Gun matches (rifle, pistol and shotgun) and what is involved with the rules, the guns and the gear.. I am not sure of the date when I shot my first 3 Gun match, but it seems like it was near the end of the Civil War, and may have involved loading from the muzzle end as part of the speed-reload. I do remember it was sponsored by the fledgling AR15.com company, and it was conducted at a range in pistol bays and the maximum distance was maybe 25 yards. It was a blast to shoot a stage with a pistol and then go back through the same stage with a carbine. Jumping ahead a couple of decades, 3 Gun has evolved into a marvelous action shooting venue with guns, gear, rules which are leaps and bounds past where it all began with the old Soldier of Fortune shoots. Major matches now routinely include stages with long distance rifle shots out to 400-600 yards, may have all shotgun stages with 30-40 targets, and are feature celebrity shooters, sponsors and prizes. The major matches are so popular they are advertised in Jan-Feb and sell out in minutes. 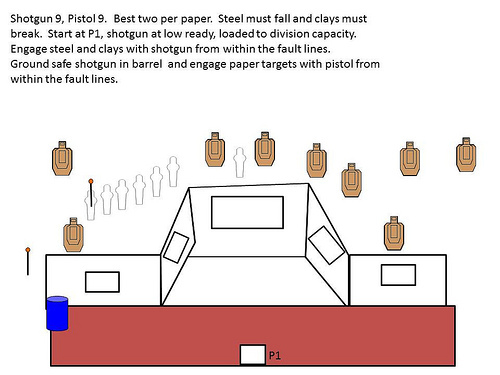 A normal 3 Gun stage will run on a timer in 120-150 seconds on a pistol or rifle range, and will probably involve the shooter engaging paper targets, steel targets and clay birds starting with a carbine or shotgun, transitioning to the other long gun and ending up finishing the course with a pistol. At the base level, you must be able to run all three guns and their reloads with some proficiency, and stay within all of the necessary safety rules. Shooters endeavor to be both fast and accurate-you can't miss fast enough to win. Muzzle awareness is paramount, and in addition to the four big safety rules we should all have memorized, the 180 degree rule is the big ticket for this type of shooting. With the 180, you must keep your muzzle pointed down range and don't sweep it beyond the 180 degrees of angle that are encompassed by the range or from the front of your body. When you are running and gunning around stages and barriers the muzzle must remain pointed down range at all times. Failure to do so will result in a disqualification, or DQ. 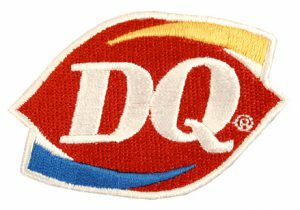 (Experienced gunners are informally encouraged to stop at a Dairy Queen on the way out of town to put a sweet emphasis on the disqualification along with the idea "I'm not going to be disqualified again!" Finding places to shoot a 3 Gun match can be the most daunting aspect to this type of competition. If you have never seen it live, it is always good to go to a local club see it in person and ask questions. If you are an experienced shooter with all three weapons, my other advice is to gather your gear and sign up for a local match and just show up.You will learn an awful lot. Tell everyone it is your first time, and I mean everyone, from the sign in people, to squad mates to the range officers. Shooters are always some of the nicest and most generous people and welcome new shooters to the sport. They will insure you perform safely and "do it right". Don't show up thinking you are internet commando too-cool-for-school with your super duper nylon gear you ordered all from the BUDK catalog. Admit you are new and are there to be safe and to learn. People will fall all over themselves to be helpful.You can also skip the part where you not so secretly think you are going to "win" on your first time out. On the plus side, you might win a prize at the end, even if you are in last place. Many matches have random draw prizes-which are always nice to "win" and certainly encourage you to come back again. 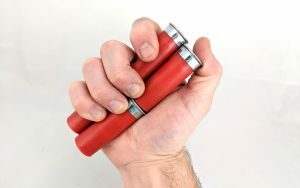 As a beginner you won't have all the perfect gear, you won't know all the ins and outs, and you will face the fact your at-home "awesomeness" may bump directly into reality that there are many many people better than you with multiple guns -but you can learn more and get better with this type of practice. I think this mental stumbling block stops a lot of people from competing. I have faced it down many times and it is humbling to see shooters who are so much faster and even more proficient. Get over yourself. You are looking to shoot and have fun. You are not going to walk on and dominate the field on your first outing. Go to be safe and learn-and to have a good time. Here is a small secret that can help advance your mental status and help you skip over a lot of seslf-imposed anxiety-as long as you are safe, nobody but you cares what your score is. Nobody. Mistakes will be made working under stress and time, but as long as you are safe doing it what does it really matter in the end? I have often repeated "Those bullets are gone. Try to do better next time." It took me years to learn to shoot just for me and my own enjoyment, and not hang everything on high stress competition and "winning." I am winning by just being there and being challenged to shoot well. You may have to travel across state lines to get to a match. Some gun ranges will run an indoor type of 3 Gun or 2 Gun matches in the winter, and to get to outdoor ranges you should look into clubs who have some experience with these matches and access to large established ranges. Check the web and Facebook or your local gun shop to locate shooting clubs near you, and don't be timid sending them messages asking about 3 Gun matches, if they don't feature them, they will know someone who does. In Northern Illinois, the Polo 3 Gun and Aurora Sportsman's Club have excellent matches and ranges. The Oak Park Sportsman's Club in Plainfield runs monthly matches in the warm months and the Milan Rifle Club hosts small matches as well. Further south, there are also clubs in or near Chillicothe, Bloomington and Newman's Gun Club in Sesser, IL. 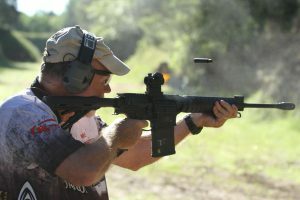 Indiana Multigun has a vigorous group of shooters who shoot in the middle part of the state as well as across the northern border at the Bend of the River Conservation Club (BORCC) in Niles, MI. In Wisconsin they run matches in Beloit at the Beloit Rifle Club and near Ft McCoy. The Rock Castle Shooting Complex near Bowling Green KY and at the Lead Farm in Versailles, MO near the Lake of the Ozarks hold smaller monthly matches in addition to hosting national level large events. Large matches may run two and three days. The have significantly more expensive match fees, offer bigger and more complex (and fun) shooting stages. At big matches, (200-400 shooters), you will get to see pro-shooters (those nearly mythical creatures who are actually being paid to shoot) and every variation of guns and gear you have ever seen in magazines and on the internet. Everyone has their own idea of what they want to run with rifle, pistol and shotgun. Unique to this sport you can also be squadded with famous shooters-what a huge learning opportunity! They have become so popular many of the major matches will sell out within an hour when their registration goes live. Almost all of the big and most smaller matches use www.Practiscore.com as the online source to locate and register for matches. Looking around on Facebook last night I found a match in Missouri I had never heard of which will be held in July. I researched it this morning via Practiscore got the location, the dates, number of anticipated stages and the match fee was $200. The match actually went live for registration at 5PM that day and you know I set a couple of alarms on my phone to insure I got online and registered.When you get registered and pay you will next be prompted to pick a squad to shoot with at the event. . If you don't know anyone going that is OK, they are chock full of friends you have not met yet. If you see my name jump on my squad. I will be glad to help out as well as tell many colorful stories about the mistakes I have made along the way! Running three guns and the associated gear does cost some money to get started, but the rule of "buy once, cry once" is associated with buying good starting gear that is not the cheapest you can find and it will serve you well. If you walk on with decent guns and decent gear you have enough- the rest is up to you. A basic pistol, AR-15 carbine and shotgun are all you need to get going. There are divisions within 3 Gun that limit the gear so people with plain jane street level guns are not shooting against people with mega-dollar maxi-zoom space guns. You may shoot along side advanced gear shooters, but you are not in direct prize competition. This is especially amazing watching someone with lots of talent, experience and advanced firearms shoot a stage in half the time you do-they are running Ferrari's in the sports car division and you are running a Jeep in the every day commuter division. The Tactical Irons or Practical class uses street level guns- an AR with either iron sights or a non-magnified red dot sight, a pistol with iron sights and a shotgun with iron sights and generally limited to 9 rounds in the shotgun. Red dot sights are extremely fast on close up targets and terrific up to 100 yards.. Even 200 yards really isn't a big deal when you believe in the ballistics for 55 gr 5.56/.223 knowing a 100 yard zero will still only drop about 2-3 inches at 200 yards. Hardly worth moving the red dot on large targets. This took me a lot of years chasing the size of the dot projected out at further ranges (a 3 MOA dot would cover 6 inches at 200 yards and an entire Buick at 500-600 yards). Misses are generally my shakiness, not the gun or optics fault. Find a stable or braced position and squeeze a few downrange. Don't "go to war" with a difficult target and burn up a 30 rd mag. If you don't hit after a few, move on. After years of using red dots I picked up a tactical scope to be able to see those targets I had been missing at long distance. You can bring almost any 9mm, .40 or .45 full sized factory semi-auto pistol you own to shoot Practical class. 4 inch and 5 inch barrels are most popular. Sub compacts like baby Glocks won't be best for longer pistol shots, but if that is all you have bring it along and try it out. (Beware of the man who only owns one gun…he just know how to use it.) You will need a secure holster (one you can jump up and down with and not have your gun leave the holster and hit the ground for another tasty trip to DQ), at least three high capacity pistol magazines (12 or more rounds). If you want to shoot a 1911 style .45 have at it…just bring lots of magazines. Most people in this class show up with Glocks, Sig's and Smith and Wesson pistols. Do you have a Steyer, Beretta or Ruger? Bring it, they will work, but most people who stay with the sport migrate to the big name work horses. About half of the Practical Shotguns are Benelli M-2's wtih longer magazine tubes, a high visibility//light gathering front sight and a dremel modified loading port to facilitate easier loading. Beretta owns Benelli and includes the Inertia Drive from Benelli in all of their brands like the Beretta 1301, the Franchi Affinity and Stoger 3000 and their M3K-a factory modified 3 Gun model. All of these guns are considerably cheaper than the Benelli and are used with success on the 3 Gun field.. Mossberg offers the factory built Jerry Miculek 3 Gun Shotgun for a reasonable price and has a large following. You will also see some Winchester, Breda and Remington Versamax on the ranges. Pump shotguns can be run, and the Benelli Nova seems to be most popular and easy to load. As far as an AR-15 carbine the sky is nearly the limit for a production gun. Sixteen inch barrel's are most common. Sights, handguards, grips, stocks and other levers, buttons, springs and parts can be had by the truckload to fit your dream of what your gun should be. From high dollar famous manufacturers to home built parts guns most AR's will just flat run if you give them a bit of initial lube and clean them once in a while and tell them they are a good dog. Get two to three 30 round magazines that function flawlessly in your carbine, I like P-Mags, but other brands and metal mags can be just as dependable, and a Magpul 40 rd is handy to have in your bucket for longer courses where you might be able to skip by that time consuming reload. I load 30 rd mags to 28 rds-some people would argue to load to max cap, but I have had full mags not seat fully into a closed bolt on more than one occasion-do what ever works for you. The Tactical Optics class (the most popular 3 Gun class) allows the use of a magnified scope on the rifle, and iron sights on the pistol and shotgun. Red dot sights are great but with the matches getting longer over the years longer magnified tactical scopes have become the norm. Most have magnified reticles and run from 1×4 power to the currrent favorite 1×6 and 1×8 power for the long distance shots. If I know a club/range is limited to 100 yard maximum I take along a light weight Carbine with a red dot scope, but if it is longer known distances I take a rifle with a 1×6 scope zeroed for 100 yds. Cranked down on "1 power" for most 3 Gun shooting, you can still use both eyes open on a Tac scope just like a red dot scope and then stop and twist up the magnification for longer distances. Open Class is the full out racing division (think dragster class) you can have multiple optics on your rifle, optics on your pistol (small red dot holo type sights) compensators on your pistol, comps and optics on your shotgun, and you can run magazine fed shotguns with enormous magazines and drums. Russian Saiga type shotguns were the initial wave of mag fed shotties in this division and currently a number of MK 1919A type guns which look like gigantic AR-15's are in vogue. Some matches will feature an Ironman or Heavy Metal division. You shoot a .308 rifle with iron or red dot sights, a pump 12 gauge shotgun and a.45 caliber pistol depending upon the rules.This is a lot of fun as you may imagine and you can neutralize a paper target with only one pistol hit or rifle hit instead of the traditional double taps wtih smaller calibers. The actual cost of all that .308 and .45 ammo can be significant, and I try to buy up boxes during the year on sale for one Heavy Metal shoot a year. I reload ammo for practice, but when I shoot for prizes I use commercial ammo-I don't want to suffer the indignity of my own reloads not feeding right while on the time. You will need a belt to carry all your magazines. You can start with a sturdy leather or nylon type but most people quickly acquire a dedicated gun belt with a velcro liner belt to distribute the load. Counter clockwise on my belt I have two open top kydex pistol pouches, two kydex AR mag holders-all those reloads come from my left hand. On the right side of the belt I have two Blade Tec mounts for shotgun shell carriers, a holster on a removable Blade Tec mount and a shooting muff's holder. Despite my wife's assertions about my having too much waistline having all of this stuff on my outerbelt can make my inner velcro attachment sag or feel tenuous so I always have a belt keeper or two to loop over both the inner and outter belts. I also have a two gun cordura gun bag with multiple pockets to carry my long guns, the pistol and some other items around to matches and from stage to stage. Loading a shotgun is the largest amount of down time while on the timer, and loading techniques have evolved from using the weak hand to load from a pocket or bag to the bottom of the gun while it remains ;pointed at the target, to the current favorite to loading four shells at at a time via quad loads. Quad loading is viewable via Youtube and involves snatching 4 shells at a time off of a shotgun shell caddy and inserting them two at a time in the gun while it is turned upside down. Current popular gear will suggest getting some of those caddies to hold at least 18-20 shells in a configuration you like-they may be vertical or horizontally held, but they are designed for this exact type of speed loading-hunting and police type shell holders won't work well. Taccom and Safariland are popular shell holder manufacturers among others. Some shooters get chest rigs with rows of vertically mounted shells-this is probably very effective, but I can't personally wear one and risk being confused with the North Korean Infantry. Major matches have made longer shotgun stages in the last couple of years and I have had to wear enough caddies to hold 45 12 gauge shells on my belt-and probably had a couple more in a leg pocket for "just in case." Oh, and you shoot, reload and shot those 45 12 ga shells at small metal targets while running down a jungle trail all in about 120 seconds. That is a lot of loading while moving-one of the things you learn in 3 Gun is to load in the slack moments when you are moving so you are topped off when you arrive at a shooting angle. This is not deadly force type practice where use of cover and loading behind cover is mandated, this is a shooting sport and where running a gun dry is to be avoided for the amount of time it will add to your overall score. In addition to a dedicated shooting belt, most shooters wear cargo pants, not just for the tacti-cool look, but for the pockets! You can shove extra mags or shotgun shells in deep pockets, and let's not overlook the comfort of loose fitting gusseted crotch pants when trying to shoot at odd angles over, under and around match props. Footwear has become a huge item with "serious" 3 Gun people with the Salomon Speed shoes and Innov8 trail type running shoes being the "in thing." Some people wear actual spikes like football shoes. Wear what you are comfortable in for a day of standing on rough ground. I generally wear tennis shoes ior a waterproof trail shoe in the summer but have a pair of lace upwaterproof boots in the car along with a set of Frog Toggs for the likely event of rain/mud. You of course have to haul all of these guns and ammo around and I use a collapsable wagon or a fold up jogging stroller with some Kolpin gun hooks to hold my rifle and shotgun firmly in place. A five gallon bucket carries most of my accessories and is oh so easy to move and it is of course waterproof. I do throw in a couple of dry cleaner plastic bags to stretch over my long guns for the rainy days. I also have a two gun cordura gun bag with multiple pockets to carry my long guns, the pistol and some other items around to matches. It has shoulder straps and is great for moving all that gear around. Regarding ammunition, bring double the amount of the stated round count. In a simple one day match with six or so stages you might have 100 rds of pistol, shotgun and rifle showing on the match sheet. Bring double the amount as you will shoot quite a bit more than the minimum. You will miss some small steel targets, like how you may want to shoot one or two extra rounds at paper targets if you werent' happy with your initial two shots to neutralize that target. It would be hard to miss enough shotgun to have to shoot that many rounds, but having lots of spare ammmo makes your day more stress free, and heaven forbid you encounter some feindish spinning shotgun targets like Death Stars, pop-up clay birds and heavy metal swinging pendulums. When you are waiting your turn in the spotlight be a good squad mate. Everyone is expected to paste targets between runs. If you are one down in the rotation or are up next you are exempt, but once you shoot, get reloaded and get back helping paste holes, resetting steel targets and police up shotgun hulls-it makes everybodys day go quicker. You may recognize the famous "Richard" sitting back behind the line telling stories and smoking cigars and so caught up in their personal awesomeness they don't have time to help paste up targets. Don't be a Richard. I have watched multi-world record holder Jerry Miculek pasting targets and resetting steel knockdown targets many many times. Jerry is akin to the Michael Jordan of action shooting, and he is not too big or too famous to help out like everyone else. 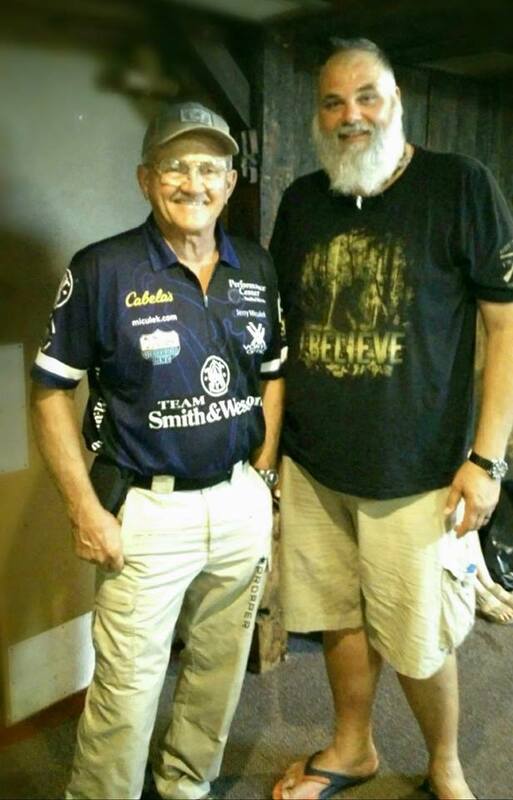 "Jerry Miculek seen here with Brian Sasquach Hobbs, is The Ambassador for 3 Gun Shooting"
Get out there and have a blast. I like it mostly because it is hard. Running all three platforms is much more challenging than a single pistol, carbine or shotgun. I run slow and try to make accurate hits and watch the young kids run like deer. I am much more comfortable moving with glacial speed these days! This entry was posted on February 9, 2019 at 1:41 pm and is filed under Blog. You can follow any responses to this entry through the RSS 2.0 feed. Danville rifle&pistol club has 3gun matches April-Nov.